We run the best Thanksgiving Soup Kitchen outside the United States. It’s a bold claim but let me offer some supporting metrics. During our time in London, we have served over 370 pounds of turkey to an estimated 420 people. This year we anticipate feeding thirty-three pilgrims hailing from France, Germany, Switzerland, Italy, Greece, the UK and the United States. And I’m confident that everyone who will celebrate with us this year would agree, London is the ultimate Thanksgiving destination. For the uninitiated, London might seem like an unlikely place to eat turkey with friends and family but in fact, with roughly 150,000 hungry Americans living in greater London, along with tourists and curious Londoners, it is relatively easy to find an excellent turkey dinner with all the trimmings. Villandry in Marylebone, Christophers in Covent Garden are good options. Hotels such as Browns, Claridges, the Chesterfield, and the Royal Garden all have special Thanksgiving menus with more informal places like Bodeans (with live NFL action for diehards) offering a more down home options. If you were to rent an apartment and prepare your festivities yourself, the best butchers such as Lidgate in Holland Park and Randalls in Fulham can source you a fabulous turkey at even more fabulous prices that puts the American butterball to shame. Just be careful about size, most English ovens are smaller than in the States. If you don’t want to cook, Whole Foods in Kensington can supply an traditional meal for up to 12 people with all the fixings. If you are not yet sold on the idea to come to London for Thanksgiving, here is some more ammunition. Late November is a relatively inexpensive time to fly to London. By contract, moving around the United States over Thanksgiving is congested and expensive. In fact, being at least 5,000 miles away from the 25 million Americans who travel on Thanksgiving Day is a pretty good idea. Also, the day after Thanksgiving is a quite normal shopping day in London. You can have a very pleasant time wandering around the stores which are already beautifully decorated for Christmas and not particularly crowded. Compare that to the riots taking place in malls across America. In addition, you will receive the warmest welcome from your London hosts. Londoners are rather intrigued with the whole notion of Thanksgiving and they are a bit envious of the fact that Americans take the day off just to ”count their blessings” with family and friends who eat themselves silly and all of this without having to buy any presents. Of course, there is always the story that the Friday after Thanksgiving is the only day a poor Brit with a hyper-active, vacation- hating American boss won’t notice if he is late to work. Well, you can’t win them all. 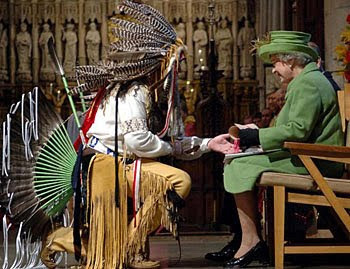 In my experience, just like the original pilgrims, if you invite representatives of the indigenous people to join you, they are always happy to oblige. And finally, you can achieve the ultimate Thanksgiving experience by paying a visit to the Mayflower Pub in Rotherhithe in southeast London from which the original Pilgrim Father set sail for Plymouth in 1620. This historic pub is authorised to sell both British and US stamps so come armed with postcards to confuse your family and friends. After hoisting a pint at the Mayflower, pay a visit to Southwark Cathedral to see the memorial to the Mohegan tribal chieftan, Sachem Mohamet Weyonomon who had travelled to London in 1736 to complain directly to George II about British settlers encroaching on tribal lands. Sadly, Weyonomon died of smallpox before getting to see the King and was buried in an unmarked grave on the banks of the Thames near John Harvard and William Shakespeare. Weyonomon’s letter to George II finally reached the hands of a British monarch on Wednesday, November 22, 2006. Yes, one day before Thanksgiving. So forget the traffic jams, the football games, the shopping malls and the Butterballs. For free spirits who want to “connect to their inner Thanksgiving”, go back to where it all really started and have the time of your life celebrating America’s greatest holiday - in London. Having spent 12 Thanksgivings in London, albeit privately, I confirm, there is none better!